Action Wildlife Removal is a leading wildlife removal service, offering dependable and professional solutions to customers for many years. We employ well trained, certified and courteous employees to solve all your wildlife issues. Our professionals are committed to delivering high end wildlife removal and control services in a timely manner. Our highly trained professionals are here to solve your wildlife problems and give you peace of mind. We are a full service wildlife removal company that can handle any kind of animal damage issue from removal to necessary repairs that not only protect your property but make it look great too. We will also sanitize your property from animal waste or deceased critters to help you restore your property. Whether it’s a family of skunks under the deck, weird noises of squirrels in the attics or strong raccoons tearing things apart, we have the right tools, experience and know-how to efficiently and quickly remove them from your property. We are the GTA wildlife removal experts. 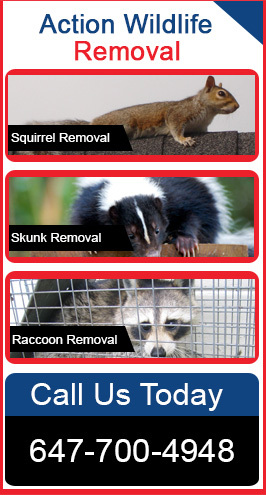 At Action Wildlife Removal, we have been striving to be the leader in the wildlife removal industry in the Mississauga, Brampton, Orangeville, Caledon, Bolton, Guelph and Georgetown area. We are committed to providing the best wildlife removal and control services in an environmentally responsible manner and at affordable prices. We guarantee quality workmanship and customer satisfaction. As GTA’s leading wildlife control specialist, Action Wildlife Removal adopts safe and human approaches to remove and relocate nuisance wildlife from inside or outside your property. Our professionals will help protect you, your family, pets, home and business from wild animals and their negative impacts. The company was established with an aim to create a balance between humans and nature’s wildlife. We are here to safeguard humans from wild animals and wild animals from humans. Call us 647-700-4948 today for the best solution to your wildlife problem.